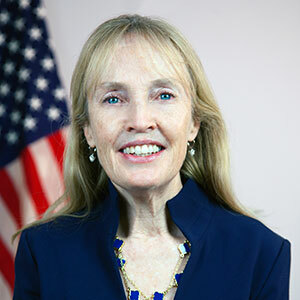 Joanne Collins Smee currently serves as Acting Director of Technology Transformation Services (TTS) and Deputy Commissioner of the Federal Acquisition Service (FAS) at the U.S. General Services Administration (GSA). In that role, Collins Smee oversees a team whose primary mission is to transform the way government agencies build, buy, and share technology, which helps federal agencies improve the public’s experience with their government. She is also responsible for implementing the recently announced IT Modernization Centers of Excellence (COE) in partnership with the White House Office of American Innovation. The COEs will house centralized, function specific talent, products, and acquisition vehicles to assist agencies in IT infrastructure optimization, cloud adoption, customer experience, and service delivery analytics. Prior to joining the Federal government in September, Collins Smee spent 25 years in the private sector at IBM, rising from an individual contributor as a software developer to ultimately become a senior executive directing thousands of people delivering solutions for commercial clients across the globe. Most recently, Joanne served as the General Manager of IBM’s Globally Integrated Capabilities, leading a team of 80,000 IBMers worldwide in the provision of technology services to IBM clients. She was responsible for managing an annual budget of $2.5B, as well as business control and audit responsibility for the unit’s personnel and client deliverables. Collins Smee’s strengths include significant international experience, operational and financial management, leadership of very large, diverse technical teams, and the development of excellent client relationships. She holds an MBA from New York University, an MA from Columbia University, and a BA from Boston College.